You may have heard the notion that all religions are essentially the same. I have come across three primary ways that this idea has been illustrated. Which of these explanations seems the most likely to you? Blind men describing an elephant. Different religions can be compared with a group of blind men tasked with trying to describe what an elephant is like. Each of the blind men touches a different part of the elephant and describes what he thinks the elephant is like based on his exposure to the elephant. The one near the trunk concludes that “An elephant is like a hose” while the one near the leg concludes: “No, an elephant is like a tree”. The main idea is that all of the blind men are describing the same thing, albeit imperfectly based on their own personal experience. All religions are paths to God. The illustration used in this analogy is a multisided mountain. Each religion is like a different ‘path’ up the mountain. Each path is different, and may require different climbing skills and provide different experiences, but they all reach the top or the mountain (i.e. God) in the end. The main idea is that all paths up the mountain are equally valid. The Golden Rule. Here is a third way of illustrating why/how all religions are essentially the same. Proponents of this view indicate that all religions teach basically the same ‘Golden Rule’: “Do to others what you would have them do to you.” The implication is that all religions essentially rest on this rule, and that no other fundamental teaching is more important or more central to each faith than how we treat each other. Perhaps you have some other explanation for how all religions are essentially the same (besides “They’re all a bunch of hogwash”). If so, I’m with you. I think there is something entirely different that is common to all religions. What is the primarily problem with humanity? What is needed to resolve humanity’s primary problem? What is God like (if he exists)? How are we to relate to God? Clearly these can’t all be true at the same time; they are mutually exclusive. What is humanity’s primary problem? Again, there is a lot of diversity in belief over this question. There is a lot of diversity of thought about the end of life. This is only a small snapshot of the differences between various religious belief systems. Nonetheless, I think we can conclude that there is a huge amount of diversity in religious belief over the ultimate questions of life. Surely God can’t both be an impersonal oneness, two opposing gods, and one transcendent God at the same time. These categories are mutually exclusive. The belief that all religions are the same is often (although not always) held by people who do not personally practice any religion. When you are unfamiliar with the details and practice of a religion, it is easy to draw false conclusions or assumptions about it – something I am trying to keep in mind in these posts! Religious people who try to promote the idea that all religions are basically the same (such as Baha’is) have to sacrifice some of the major beliefs of each religion in order to do so. When it comes to religion, the devil is in the details, and the details are profound. Working all religious beliefs into one necessitates the elimination of some of the mutually exclusive but core beliefs of each one. I am indebted to Dean Halverson and The Compact Guide to World Religions for some of the ideas presented in this post. 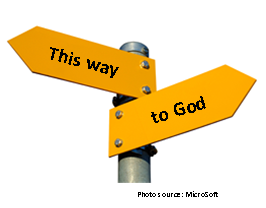 ← How Do You Decide Which Religion to Follow? Thanks. Some good food for thought and for engaging others in discussion when the “all religions are the same/equally valid” point comes up. I especially like your point that the BIG questions that humans have about life, death and God are similar – but the answers are very very different depending on your faith and worldview. Excellent post. I have often encountered all three analogies about religions. I agree with you that each religion presents a different answer to the basic questions of life and therefore they can all be false but not all be true. I think there are a number of underlying motivations for this view. Firstly people associate religion with one’s culture and ethnicity, and so to claim that there is a true religion is understood as meaning there is a superior culture and others are inferior. Secondly people see it as a moral ideal to be tolerable and non-judgmental about other people’s beliefs. To judge and say that other religious beliefs are true, is seen as arrogance and a lack of tolerance. Thirdly people do not think it is possible to have knowledge or certainty about religion on par with say scientific knowledge. They relegate religion to the unknowable realm, and reduce “faith” to a blind leap into the unknowable. Thanks for your insights. I totally agree with you on your three points about how people view religion – it would be worth a future post to investigate these further. Awesome article, thanks. Agree with everything, you are spot on.